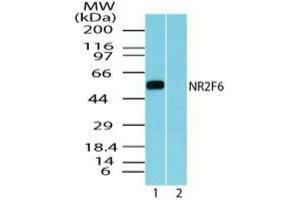 Western Blot: EAR2/NR2F6 Antibody [NBP2-24510] - Analysis of NR2F6 in mouse embryo brain lysate in the 1) absence and 2) presence of immunizing peptide using NBP2-24510 at 5 ug/ml. Goat anti-rabbit Ig HRP secondary antibody and PicoTect ECL substrate solution were used for this test. Immunogène A portion of amino acids 20-70 of human NR2F6 was used as the immunogen.